Youngest daughter to Rick, Ashley grew up in graham for the last 25 years. At an early age Ashley realized that she had a passion for customer service and believing in going above and beyond the industry standard. At age 23 her dad Rick and mom Rebecca approached Ashley with the opportunity to purchase and take over the family business. For the last few years Ashley has been learning the ins and outs of the industry and working side-by-side with her father. When asked what she likes about most about being in the automotive industry she said “I just love helping people, I feel proud to continue a legacy my father has created by providing his customers with honest and quality repair, and I plan to continue that legacy for years to come.” Ashley has had a passion for horses since she was 5 and in her spare time she loves to be outside and enjoying her time with her horse Riley and spending time with her family. Greg was born in Olympia and has lived there his whole life. 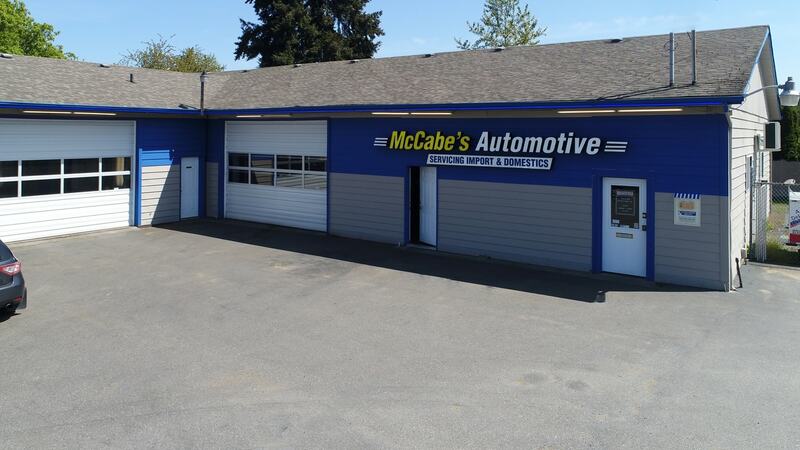 He has been in the automotive industry for over 23 years and with McCabe’s for over 13 years. When asked why he was interested in the industry he replied that “As a teenager he always had cars that broke down and he never knew how to fix them so he went to school for automotive so he could fix them for himself and for other people.” He enjoys the fact that there is something new for him every single day. 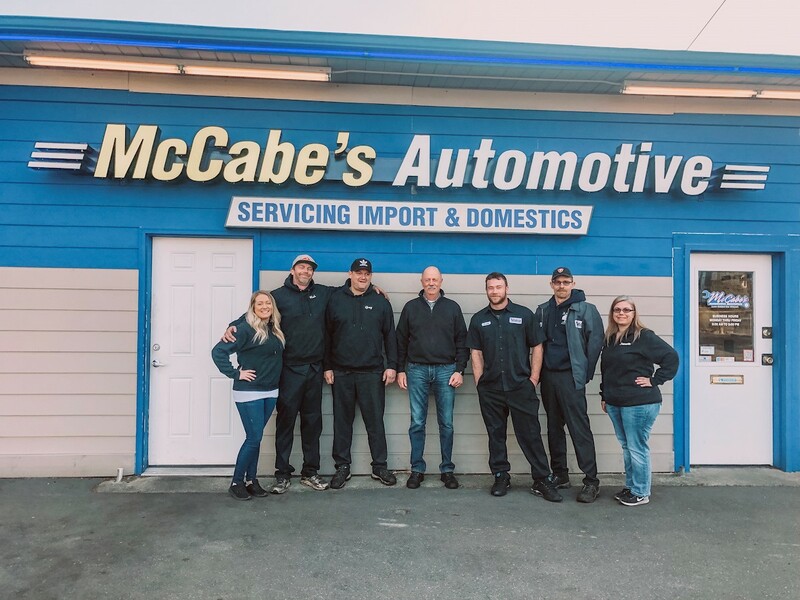 Before McCabe’s Greg spent 8 years at Pacific Auto of Tumwater and 2 years at Precision Auto. Greg lives with his girlfriend Barbi of many years and his son Garryn. He also has 2 dogs Petey and Hunter. He is ASE certified in all areas and is a master technician. In his spare time he likes to go camping and do outdoor activities with his family and friends. Rush has been with us since June of 2017 and has been in the automotive industry for over 12 years. He was born in Lakewood Washington and grew up in Tacoma and Steilacom. When asked what interested Rush to get into the automotive industry Rush said he blames his father for his passion for cars. As a young boy, his dad had a 1986 Dodge Raider that he was pulling the engine out of and he let Rush do most of the work. Rush has spent most of his automotive career working on Subaru’s at Pacific Import Auto where he did basic maintenance to building race Subaru and everything in between. Rush really enjoys taking things apart and figuring out how they work. He especially enjoys seeing customers faces when he has made them happy and helping people to the best of his ability. Rush is currently becoming ASE certified in all departments and in his spare time, he likes to go on road trips, hiking, exploring new places and finding new places to eat. Frank is the newest member of our crew and has been in the automotive industry for over 15 years! When asked what he likes most about the automotive industry he replied, “I really like that everyday you’re faced with a new challenge, and you get to do something new every single day.” Frank is working on becoming a master technician and is extremely passionate about the work he performs. In his spare time Frank loves to be outside, hunting and fishing is extremely important to him. If Frank isn’t at work you will find him out on the water. Everyday after work Frank goes to the gym and works out to stay in shape! Roper and Timber come to the shop every single day with Ashley. They are her personal dogs that act as the professional welcoming committee. 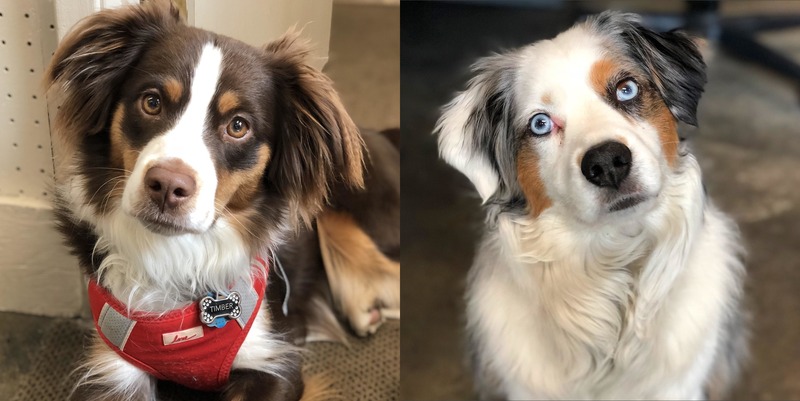 Roper is a blue merle mini Australian shepherd that is 7 years old and Timber is a red tri mini Australian shepherd puppy that I less than a year old. They both love to be scratched and loved in when customers are waiting in the lobby. They can’t wait to meet you!